Can a Kitten Eat Cooked Chicken? A bit of chicken will leave your kitten licking her lips. Carnivores by nature, cats enjoy a diet packed with protein. Chicken is a lean meat that your kitten will gobble with gusto. Many commercial cat foods contain chicken along with other nutrients, but whole chunks of cooked chicken should be a treat, rather than a staple food. Cooked chicken meat in small amounts is perfectly safe for your kitten. Wild cats prey on birds as part of their normal diet, and chicken is generally considered a healthy meat because of its low fat content. To protect your kitten's health, look for chicken that is free of antibiotics and hormones. While these may not be harmful to humans in small amounts, they could make your fuzzy friend extremely sick. Rinse the chicken under cool running water, and pat it dry. Pull the skin from the chicken and place the chicken in a medium-sized sauce pan. Pour enough cold water into the pan to completely cover the chicken. Turn the heat up to medium and bring the pot up to a simmer. Let the chicken cook for at least 20 minutes, drain, and let it cool completely before feeding. Cooked chicken should be fed to your kitten as a treat no more often than once or twice a week. Some people think it’s safe to feed a kitten cooked chicken as a diet staple, but kittens have very complex dietary needs that are not met by chicken alone. Remove the chicken from the bone, and cut it into bite-sized chunks. The pieces should be small enough for your kitten to chew, but not so small that she can swallow them whole. Always check with your veterinarian before changing your kitten's diet. 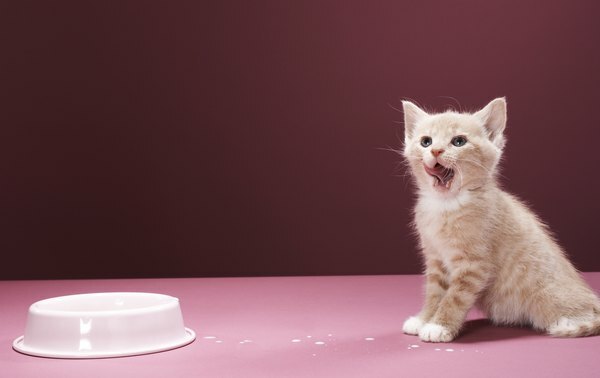 Even small changes may be enough to give your kitty an upset tummy. Never feed your kitten cooked chicken bones. Cooked chicken bones will splinter when chewed, and may cause serious damage inside your kitten’s tender tummy. Don’t give your kitten chicken that has been cooked with garlic or onions. These are commonly used to spice up human food, but even small amounts can poison your kitty. RSPCA: What Should I Feed My Kittens? Can Kittens Eat Canned Tuna? What Can a Kitten Eat?